Transparency Market Research states that the global alcohol packaging market is highly fragmented due to consistent entry of several regional players. To stay ahead of the competition, players are introducing innovative methods of packaging that are not only attractive but also eco-friendly. Some of the prominent companies in the global market are expected to focus on acquisition, new product launches, and expansion to newer markets to improve their revenue. Amcor, Ball, Owens-Illinois, and Tetra Laval are the key players defining the competitive landscape of the global alcohol packaging market. 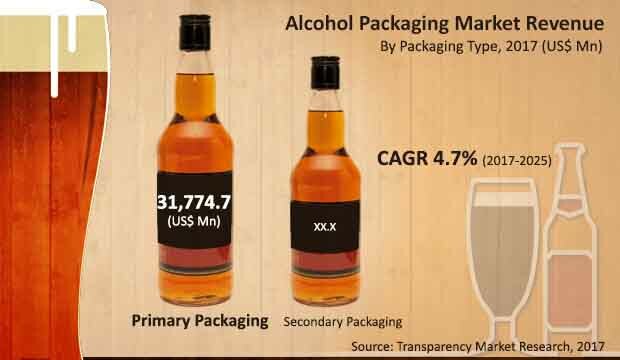 According to the research report, the global alcohol packaging market was worth US$40,009.2 mn in 2017 and is expected to be worth US$57,746.9 mn by the end of 2025. Out of the packaging type, the primary method of packaging is likely to drive the global market in the coming years as it is slated to account for a share of 80% in the overall market. Regionally-speaking, Asia Pacific is expected to show tremendous growth in the near future as the emerging economies in the region are witnessing rapid urbanization. Asia Pacific alcohol packaging market is expected to surge at a CAGR of 5.3% during the forecast period. The global alcohol packaging market is predominantly being driven the rapid pace of urbanization in various parts of the world. The rising disposable income amongst the urban dwellers has made a significant contribution to the soaring profits of the global alcohol packaging market. Furthermore, changing lifestyles and growing consumerism is expected to play an integral role in the development of the global market. Introduction of unconventional packaging methods and development of better materials are also projected to be key drivers of the global market. Improving branding and marketing strategies has prompted several alcohol manufacturers to invest in packaging alcohol. Packaging formats have become synonymous with brand identification in the alcohol industry, which is expected to bring in a rise in the expenditure on alcohol packaging in the near future. Design and development of sustainable packaging solutions is expected be the global market a solid boost in the forthcoming years. Analysts anticipate that pouch packaging will gain traction in the near future as it a convenient and lightweight to carry. The report observes that demand for sustainable pouch packages will be an emerging trend in the global market. It will be wise to capitalize on this trend as prices of plastic resins and paper pulp are slated to rise, thereby impacting the cost of packaging. On the flipside, the global alcohol packaging market faces a few challenges that are likely to hamper the growth of the growth. The consistent rise in the cost of raw materials that are to be used for packaging is expected to tug the market in the opposite direction. For instance, the cost of manufacturing plastic is expected to have a negative impact on production of plastic-based packaging materials. Furthermore, the health risks associated with plastic packaging is expected to reduce the consumption of plastic for alcohol packaging materials in the near future. The report also highlights that legislative prohibition on consumption of alcohol and religious ban on the same are also expected to be restraints for the global market. This review is based on Transparency Market Research’s report, titled “Alcohol Packaging Market (Primary Packaging (Bottles, Cans, Liquid Brick Carton, Bag-in Box, Growlers, and Pouches); Secondary Packaging (Boxes, Folding Cartons, Multipacks, and Tubes); Application – Beer, Wine, Spirits, Ciders, and FAB; Material - Glass, Metal, Plastic, Paper and Paperboard) Global Industry Analysis and Forecast 2017 - 2025”.